“In hindsight I think I should not have reacted at all,” the Arsenal boss admitted. 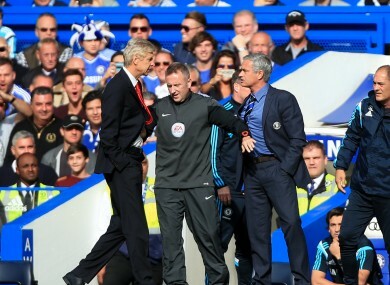 Chelsea manager Jose Mourinho (right) has a heated exchange with Arsenal manager Arsene Wenger (left) on the touchline. ARSENAL MANAGER ARSENE Wenger has apologised for pushing Chelsea counterpart Jose Mourinho during last weekend’s clash at Stamford Bridge. The pair became involved in a physical altercation during Chelsea’s 2-0 win in the Premier League last Sunday. Wenger placed his hands on the chest of his opposite number, who was urging the Frenchman to keep out of the Chelsea technical area following a foul from Gary Cahill on Alexis Sanchez. The Arsenal boss told Telefoot: “They gave too much importance to this story. Wenger also claimed he was provoked by the Chelsea manager, with relations between the pair notoriously frosty. The result means Wenger has failed to get the better of Mourinho in 12 meetings. Email “Arsene Wenger says sorry for Jose Mourinho push”. Feedback on “Arsene Wenger says sorry for Jose Mourinho push”.